Los Angeles, CA (January 22, 2014) – Metro-Goldwyn-Mayer (MGM) announced today a yearlong global campaign to honor the studio’s storied 90-year legacy. Founded in 1924 when theater magnate Marcus Loew bought and merged Metro Pictures Corp. with Goldwyn Pictures and Louis B. Mayer Productions, MGM and its legendary roaring lion logo signify the golden era of Hollywood to film lovers around the world. Since its inception, the company has led the industry in creating some of Hollywood’s greatest stars and is home to over 175 Academy Award®-winning films, including 14 Best Pictures. “What a supreme honor it is to preside over a company with such an unparalleled legacy. 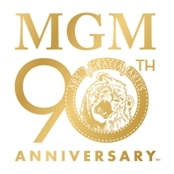 It’s remarkable to have this opportunity to reflect on MGM’s amazing achievements in film history while also looking ahead to MGM’s bright and promising future,” said Gary Barber, Chairman and Chief Executive Officer. Additionally, several of MGM’s signature films including Rocky, Rain Man, Fargo, RoboCop and The Good, The Bad and The Ugly, have been meticulously restored in 4K resolution (four times the clarity of HD) and will be presented on Blu-ray™ for a beautiful, high-definition home viewing experience. These re-releases will be issued through MGM’s home entertainment partner, Twentieth Century Fox Home Entertainment, and are now available for pre-order on Amazon. ● MGM will complement its already vast collection of films currently available on Blu-ray™ by releasing new titles across all genres throughout the year. Upcoming titles for release include In the Heat of the Night, A Chorus Line, and The Birdcage. ● MGM has created a one-of-a-kind collector’s book and bonus video disc companion commemorating 90 amazing years, featuring interviews from award-winning filmmakers, directors, and actors discussing the significance of their contributions to MGM’s legacy. The book and video highlight the evolution and history of the legendary studio and provide an extensive look into the studio’s golden years, classics, iconic franchises and much more. Interviews include Sylvester Stallone on Rocky, Clint Eastwood on The Good, The Bad and The Ugly, Susan Sarandon and Geena Davis on Thelma and Louise, and Walter Mirisch on The Pink Panther. The bonus disc will also be available accompanying select DVD offerings. ● Fans can also relive their favorite film moments at www.mgm90th.com, a unique Tumblr website and the first Tumblr integration to feature a studio’s full library. The MGM 90th Tumblr site’s dynamic design encourages fans to explore and immerse themselves into rich content celebrating 90 years of MGM filmmaking. As fans integrate socially with the yearlong celebration, the Tumblr site will serve as an active aggregator showcasing all of the current sharing and postings. This fresh approach to syndicating content to fans allows a seamless integration appealing to all ages within Tumblr’s rapidly growing platform and beyond. Titles, release dates and packaging continuing this iconic celebration will be confirmed in the coming weeks.